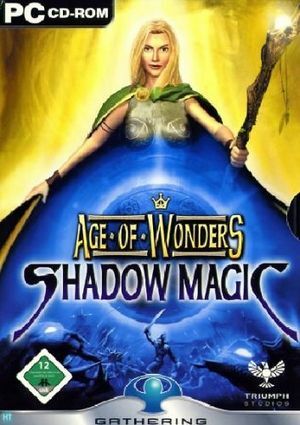 Age of Wonders 2 Heaven with Shadow Magic as well. This problem shows up as Window being the only display option available. Red overlay that indicates areas pioneers can't build an outpost doesn't appear. Red overlay that indicates targets that are out of range doesn't appear. Zoom level is stuck at 100% and can't be changed. Bloom effect around lights is not present. Open dgVoodoo.conf and edit the following lines to say the following: FullScreenMode = false,ScalingMode = centered,WindowedAttributes = Borderless and AppControlledScreenMode = false. 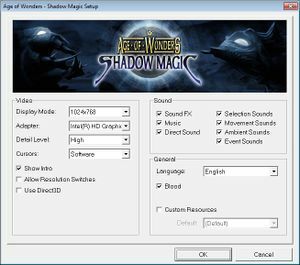 Open Age of Wonders: Shadow Magic Setup (AoWSMSetup.exe) and change the Display Mode option to your monitor's resolution. Also make sure that Use Direct3D is enabled. dgVoodoo 2 translates DirectX 8 and earlier calls to DirectX 11, as well as providing options to manipulate a game's graphics and window. Open the archive you downloaded and extract dgVoodoo.conf and dgVoodooCpl.exe to the game's installation directory. Open the MS folder inside the archive and extract the 3 DLLs to the game's installation directory. ↑ 1.0 1.1 File/folder structure within this directory reflects the path(s) listed for Windows and/or Steam game data (use Wine regedit to access Windows registry paths). Games with Steam Cloud support may store data in ~/.steam/steam/userdata/<user-id>/61520/ in addition to or instead of this directory. The app ID (61520) may differ in some cases. Treat backslashes as forward slashes. See the glossary page for details. This page was last edited on 10 April 2019, at 07:19.